The UBU RAG (Raise And Give) campaign is all about giving our students the opportunities to make a difference to the charities they care about! We focus on our 3 RAG nominated charities (Guide Dogs UK, The Yorkshire Air Ambulance & The Cellar Trust) but will support students to fund raise for any charity they wish. 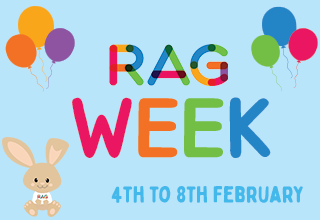 The annual RAG week is taking place 4th - 8th February and we have events throughout to raise lots! With food, drinks and chances to win there are lots of ways to get involved! Decorate a mug using Chinese symbols in room 101 from 12 till 2. Spaces are limited so please come early!